Turn the beat around with these essential tracks chosen by the DJs and promoters keeping the classic disco scene alive and shimmying across the U.S. While some thought the days (and late, late nights) of disco wrapped up in the final part of the 1970s, there are numerous parties from coast to coast that are keeping the classic disco spirit, community and carefree vibe burning hot. And, just like disco’s original roots, many of the parties have an underground sensibility, catering to a mostly gay and diverse crowd. While some folks associate disco with Saturday Night Fever, it really was the music of the disenfranchised (gays, people of color) before it hit the mainstream. There is poignant nostalgia that surrounds disco—for that freewheeling time full of sexual expression and joy—before the horrific AIDS crisis struck, and so many lost their dear friends and loved ones. At these parties happening now, some dancers remember the songs from the first time around (and know all the lyrics), while there’s a new generation of younger listeners and DJs eager to learn and keep disco’s history and stories alive. While some parties are dabbling with disco before launching into a night of house music, or playing the more recent genre of Nu Disco, here are some of the top parties around the United States focused on just classic disco—and we asked their DJs and promoters to share their favorite and essential disco tracks. Big, bearded vinyl archaeologist DJ Bus Station John is considered San Francisco’s chief disco guardian, whose extensive knowledge (music, disco, gay history, film, you name it) is only matched in depth by his staggering collection of records. He started The Tubesteak Connection in 2004, making it the longest-running weekly gay dance party in San Francisco history, and is also known for his DISCO DADDY! party. His handmade collage fliers are legendary. You won't be able to find him on Facebook, but you can sign up for his saucy, NSFW newsletter here. Read more about his parties here. From the French group best known for the space-y instrumental classic “Magic Fly” comes this exuberant epic track, featuring vocals by the great Madeline Bell. It's totally elevating, taking the dancer on a sophisticated-yet-happy trip-within-a-track, and clearly crafted by talented, imaginative adult musicians for the adult dancers that largely populated our discos “back in the day.” Stellar musicianship, killer breaks and with a running time of 6:43 that has absolutely no filler—why settle for less? San Francisco’s monthly Go BANG! party is like coming full circle for Steve, who was a resident at SF clubs like Trocadero Transfer and I-Beam back in the day, to meeting Sergio Fedasz in 2009 and together building the party in the early years (and now with Prince Wolf). Their mission has always been “to bring back the spirit of the legendary gay clubs when disco was the soundtrack for joy, unity, sexiness and liberation. Where the relationship of dancer and DJ was paramount and the dance floor is a sanctuary (no cell phones). Where people feel they belong. We're grateful to see such a diverse, intergenerational crowd coming for that experience now.” Read more about Go BANG! here. 1. Tata Vega / "I Just Keep Thinking About You Babe"
This song has gospel elements mixed with soulful jubilation. Anyone with a pulse would have to rise up with joy on the dance floor—I see it every time it's played. 2. Sandy Mercer / "You Are My Love"
This is my favorite love song. It is pure emotion, happy, triumphant and real. I've seen it bring tears of joy to many, as it has to me. 3. Black Ivory / "Mainline"
This is one of my favorite anthems of the New York and garage urban sound. It's a transitional record of disco to house, and it hits deep. 4. Sylvester / "I Need You"
Sylvester personifies San Francisco and all that’s unique about the city. He has sainthood here and beyond. His music is a fusion of soul, gospel and electronic that goes straight to the heart. This is my favorite example of all of that. 1. Dinosaur L. / "Go BANG!" This song is the namesake of Go BANG!. Our philosophy and catchphrase come from it. It's an example of some great New York art school disco, and is produced by disco legend Arthur Russell. 2. Carl Bean / "I Was Born this Way"
This is a gay disco anthem from the disco era, and one of Go BANG!’s anthems, especially when we get into Pride time! 3. Teddy Pendergrass / "You Can't Hide from Yourself"
Another Go BANG! anthem! It takes a lot of strength for one to be themselves, real and true, and this song reflects that energy and the ultimate futility and sadness of one not being 100 percent themselves for whatever reason. 4. Sylvester / "Tell Me"
Sylvester is Go BANG!’s icon. We love all his songs. His spirit. His legacy. It’s hard to choose a favorite song, but this is one of the select few I personally play. And still hope one day to walk the aisle in Grace Cathedral to this. Greg Scarnici is a DJ/producer and one-half of house music duo, Undercover. He is known for his monthly tea dance at The Monster, Below Tea, with Robin Byrd. He specializes in disco and house, and DJs in downtown NYC and on Fire Island all summer long. Read more about Below Tea here. 1. Cerrone featuring Jocelyn Brown / "Hooked On You"
You can't go wrong with production by Cerrone and vocals by Jocelyn Brown. “Don't need no grass or cocaine—I’m hooked on you!”—indeed! I always use this as a segue from the early part of the evening to when things start to heat up. 2. The Originals / "Down to Love Town"
This is one of those songs that always gets the room moving (whether the crowd knows it or not) thanks to the uplifting message of looking for love after you lose it. 3. Sylvester / "Dance (Disco Heat)"
Although the song is credited to Sylvester, it’s the high-energy vocals from Two Tons O’ Fun that helps take the party to the next level whenever I play this track. This is one of those infectious, energetic tracks always has the children running up to ask me what it is. Buffalo-born DJ Michael Wilson has been spinning in New York City since 1984, with residencies at Tracks, Champs, the Sea Tea boat ride and other hotspots. 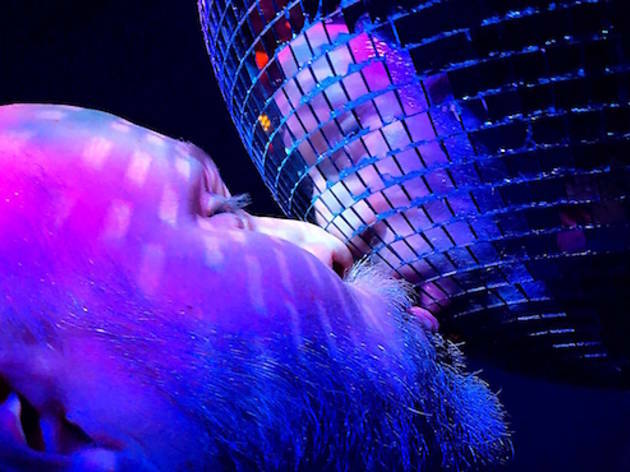 For the past 10 years, he’s been igniting a “Disco Inferno” on Tuesday nights at legendary Greenwich Village club, The Monster (read more here). 1. Diana Ross / "No One Gets the Prize"
Not a night goes by that someone doesn't request this mid-tempo floor-filler. Produced by Ashford & Simpson, it gets the crowd going every time. 2. Dan Hartman / "Instant Replay"
A great peak-of-the-night disco track. It has amazing energy from the first beat to the last. 3. First Choice / "Love Thang"
This funky gem works just fine at the beginning, middle or end of the night. Actually, just about anything from First Choice goes over well at The Monster. When you hear that classic Philly beat, you have no choice but to get down. 4. Donna Summer / "Spring Affair"
No disco party is complete without Donna Summer, of course. While better known for her later smash hits, true fans adore the Queen of Disco’s gorgeous tracks from the mid-’70s, produced by the legendary Giorgio Moroder. Lina Bradford grew up in New York City, across the street from Carnegie Hall on the Upper West Side. She identified as trans at a young age, and her career in entertainment began at an early age as a dancer. Those same moves she learned in rehearsals became a part of her signature style when she began her DJ career by performing throughout the gritty East Village scene. She is beloved for her residency playing at Fire Island/The Pines for 10 years, which has sadly come to a close, and is busy with her current party, Throwback Sunday. Read more about Throwback Sunday here. 1. Jean Carn / "Was That All It Was"
This is a classic end-of-the-evening song that represents so much love, hope and promise. 2. Candi Staton / "Victim"
You can't have a set without Candi Staton. The words to this song are so heartfelt. 3. Gladys Knight & The Pips / "Bourgie Bourgie"
This one brings you back to an era of excess and fun. 4. The Jones Girls / "You Gonna Make Me Love Somebody Else"
This track sets the premise of the beginning of the evening, and gets you ready for what’s to come. Be sure to read our piece about each of the classic disco parties hosted by these talented DJs and promoters.